Tuesdays are normally a slower time in the Big Brother 2014 house, so it is time for CBS to share the pictures from the Photo Booth for Week 3 on Big Brother 16! Yeah, not much excitement after seeing duck faces week after week, but they post them and we share them! Check out the new photo gallery below in our Big Brother 2014 spoilers! Not sure why, but they don’t have as many photos this week and not many of the HGs are present for this one. Is it just me or does Jocasta seem like she is more fun in these photo booth photos and in her Diary Room sessions than she seems on the actual show? She is never involved with anything on the show, but then her DR sessions are often funny and have some sass to them! Yawn to both the photos and the game play. It’s beyond me, why anyone would have their picture taken making such ugly faces YUK!!! Have to be young and stupid I guess. Granted the pics are not ones you would want to hang on a wall but there’s only so much you can do without becoming boring. Not pretty to look at but who wants to look at a bunch of photos with them just sitting still and smiling at the camera. Not saying i like them (i don’t) but i can understand them wanting to spice it up a bit. I suppose. I’m a Leo and we are vain, I always try to look my best. I agree Barbara. BORING Donny wake up the house and put some of your beard in their food please. Oh no, that is totally gross. Almost as bad as the cleaning the toilet with a toothbrush episode. 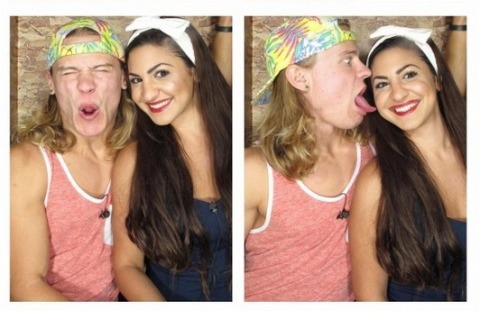 I heard Frankie, Zach and Cody talking last night that Cody would get his photo booth session early today. Maybe that’s why not all hgs are front and center. Sleep is more important than photos i suppose. I can only imagine how their parents must feel when they see these. Maybe they don’t watch it. I know Donny’s parents don’t. Did you see the interview with them? They didn’t even know what BB was and that their son was on TV competing in it. Yes I seen it. Such good old country folks. Easy to see how he turned out the way he has eh? Exactly, and if I remember correctly don’t he still live at home. I heard he wanted to stay home and take care of his elderly parents. I don’t recall that but I sure wouldn’t put it past him. His girlfriend is very patient – at their age I’m sure she’d like to get married and start a life together. He’s talked about living 5 miles from his parents house and 2 miles from his brothers. Thank you Cat. I appreciate it much.